FMC™ 201 Product Information | Smooth-On, Inc.
Shrinkage negligible in. / in. Specific Volume 20.5 cu. in./lb. FMC™-201 is part of the Smooth-On family of polysulfide rubber mold compounds. FMC™-201 cures overnight with negligible shrinkage to a soft Shore A15 rubber that stretches and exhibits good tear resistance. Molds made of FMC™-201 are very durable and will perform in production. FMC™-201 is ideal for those applications that require capturing intricate detail from a variety of model surfaces. 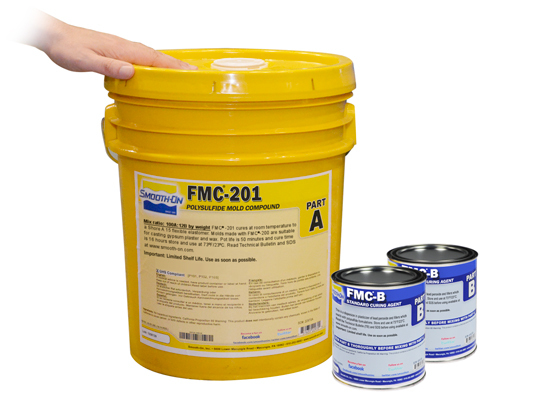 Unlike polyurethanes, FMC™-201 is not sensitive to moisture and can be poured directly over wet plaster or water/sulfur based clays. Common applications include molds for foundry and pattern work, sculpture (lost wax process), casting various gypsum products and waxes. Some Materials Must Be Sealed - To prevent adhesion between the rubber and model surface, models made of porous materials (gypsum plasters, concrete, wood, stone, etc.) must be sealed prior to applying a release agent. SuperSeal™ (available from Smooth-On) will seal porous surfaces like gypsum or wood and have minimal effect on surface detail and texture. Sulfur-free and non-water based clays require release agent only. Thermoplastics (polystyrene) must also be sealed with shellac or PVA. In all cases, the sealing agent should be applied and allowed to completely dry prior to applying a release agent. This product has a limited shelf life and should be used as soon as possible. Applying A Release Agent - A release agent is necessary to facilitate demolding when casting into or over most surfaces. Use a release agent made specifically for mold making (such as Universal™ Mold Release - available from Smooth-On). A liberal coat of release agent should be applied onto all surfaces that will contact the rubber. IMPORTANT: To ensure thorough coverage, lightly brush the release agent with a soft brush over all surfaces of the model. Follow with a light mist coating and let the release agent dry for 30 minutes. If there is any question about the effectiveness of a sealer/release agent combination, a small scale test should be made on an identical surface for trial. YOU MUST STIR PARTS A AND B THOROUGHLY BEFORE YOU BEGIN. Materials should be stored and used in a warm environment (72° F / 22° C). This product has a limited shelf life and should be used as soon as possible. Mixing should be done in a well ventilated area. Wear safety glasses, long sleeves and rubber gloves to minimize contamination risk. After mixing Part B, pour the desired amount (as measured by weight) into a clean container. Add the appropriate amount of Part A by weight. After dispensing required amount of Parts A and B into mixing container, mix thoroughly for 3 minutes making sure that you scrape the sides and bottom of the mixing container several times. Although this product is formulated to minimize air bubbles in your cured mold, vacuum degassing will further reduce entrapped air. Pour as soon as possible after mixing to obtain lowest viscosity and best flow. Curing - Allow the mold to cure overnight (at least 16 hours) at room temperature (77 F/25 C) before demolding. The mold will cure faster at higher temperatures and will cure slower at lower temperatures. Do not cure rubber where temperature is less than 65 F /18 C.
Using The Mold - A release agent should be applied to the mold before each casting. The type of release agent to use depends on the material being cast. The proper release agent for wax, liquid rubber or thermosetting materials (Smooth-On liquid plastics) is a spray release made specifically for mold making (Universal™ Mold Release). Be sure to follow directions for proper application of release agent. Prior to casting gypsum plasters, sponge the mold with a soap solution for better plaster flow and easy release. Mold Performance & Storage - Fully cured molds made are tough, durable and will perform if properly used and stored. The physical life of the mold depends on how you use it (materials cast, frequency, etc.). Casting abrasive materials such as concrete will eventually erode mold detail, while casting non-abrasive materials (wax) will not affect mold detail. Before storing, the mold should be cleaned with a soap solution and wiped fully dry. Two part (or more) molds should be assembled. Molds should be stored on a level surface in a cool, dry environment. Do not stack molds, expose them to moisture or UV light.